Google is rolling out a new update to its Maps app for Android that will make it easier to access commute information as well as information on nearby places. The redesigned user interface nos includes a new information panel at the bottom of the home screen, which users can swipe up to reveal three tabs: one for nearby places, one for real-time commute information and one for public transportation. Google Maps Product Manager Marcus Lowe explained the new additions in a blog post. The places tab offers curated lists of places to eat and drink, with options like the "best diners," "cheap eats," or "business dining." From this tab, you can also search for ATMs, pharmacies, gas stations, and grocery stores. The second tab shows your estimated arrival time for a drive to your house or to work — assuming you have these addresses saved to your Google Maps account. You can then tap on your desired route for turn by turn navigation or just choose to receive real-time traffic information as you drive. Finally, the third and last tab is designed to provide you with public transit options and make suggestions based on where you are and what time it is. You’ll see when the next bus or train is arriving along with ETAs for each individual ride that you can share with friends and family. 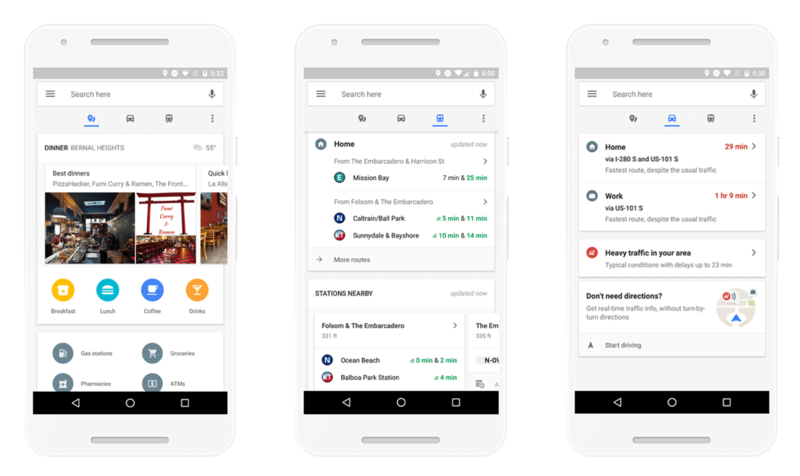 These are not new entirely new features to Google Maps but rather a redesign meant to bring the most commonly used features to the forefront of the experience. The update comes about a week after the company introduced another feature aimed at helping you get around more easily a new feature called Parking Difficulty, which calculates the anticipated parking situation at your destination.